The Journey: First X-country flight! Yes it's true. I got to experience a cross country flight on friday. I wasn't PIC (Pilot in Command), Franky was (pictured here). 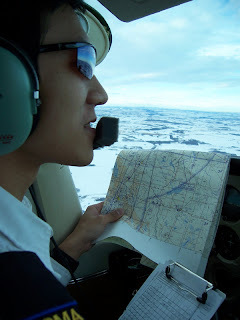 He's a Chinese student here and a very good pilot. We flew Three Hills - Wetaskiwin - Stettler - Three Hills. Apart from a crusty gyrocopter pilot at Wetaskiwin and a huge snow drift on the runway at Stettler, the flight was uneventful. When flying, we're actually going for uneventful. 'Events' usually are more negative than positive when they happen in the air. I have a video of the gyrocopter pilot that I might post. It doesn't show him being crusty, just doing a touch and go. He was crusty because he thought we didn't know which direction the circuits were going at the Wetaskiwin airport, which of course we did. I'm currently planning my first cross country as PIC. It will likely be Three Hills - Sundre - Red Deer - Three Hills. I'll keep you posted on that as it develops. I'm also hoping to get a 'Current Flight Hours' box somewhere on this blog so you can quickly see how much time I've spent with my head in the clouds to date. We had a lot of fun eh.. didn't we? I'd fly with you any day. It was a good x-country flight. Especially when the Edmonton Flight Service Station called you up and told you that your transponder showed you at 1500 ft less than your actual altitude. One of these times it would be good to do a x-country in to class C airspace so we can deal with some ATC guys.